Cameo is part of the Chien J. Wang Collection designed by international designer Chien J. Wang. Reel is made of polished white stone with a black crystal top, base and engraving panel. Chien uses this technique quite often by utilizing contrast to bring out the beauty. 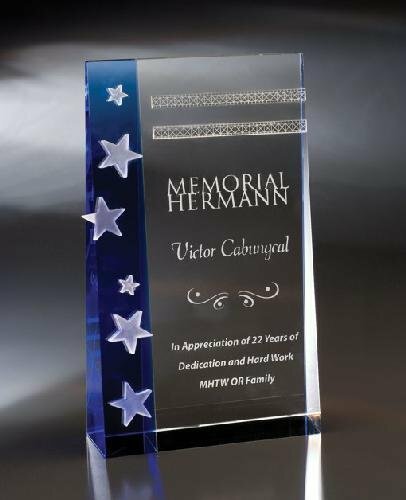 This solid, clear premium optical crystal stands strong, perfect for recognizing a job well done. Capella is part of the Chien J. Wang Collection designed by international designer Chien J. Wang. Clear crystal is fused with blue crystal to form a wedge. Frosted crystal stars are applied on the blue crystal to give a striking contrast. Two artistic crystal strips are placed on the top portion of the wedge to give this piece an added designer element. This pristine award is ideal for your star recipient. The Capella Star is an incredible optical crystal pyramid topped by a shining star. With ample space for a personalized message, this gift is sure to thrill your recipient. This award is available in three sizes. Capitol is part of the Chien J. Wang Collection designed by international designer Chien J. Wang. 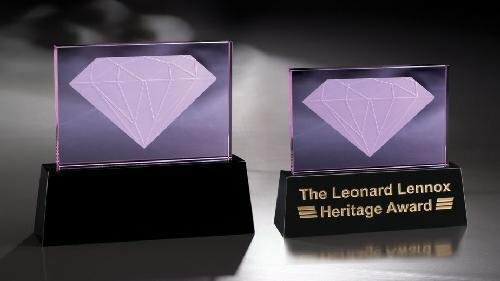 This award combines four pieces of black crystal and is supported in the middle by an amber colored crystal. Adding gold color fill is recommended for this award.